Situated in the seaside suburb of Berea, Bentley Lodge offers affordable yet comfortable accommodation in the coastal town of Durban. It is ideal for business/corporate travelers, school, church or youth groups. The Lodge has 32 well-appointed air-conditioned guest rooms each have double beds and/or two single beds and en-suite bathrooms, a storage cupboard and a flat screen TV. Our self catering option on offer is the family unit which sleeps seven. There are four available. These three-bedroom units are fully furnished and equipped with double and single beds as well as fully fitted and equipped kitchens..
A Full Buffet Breakfast is offered to groups of 6 or more at R120 per person per day. Booking for breakfast is essential and done direct with the establishment once the accommodation reservation has been confirmed. Buffet Lunches and Dinners are also served. Inquiries and Bookings for these can be made at the establishment. Guests can spend their days soaking up the sun at our swimming pool, enjoy good food with soothing jazz music in the background or enjoy live entertainment at Jay Bee's Jazz Cafe' our on-site Restaurant and Events Venue. Guests can look forward to having a pleasantly memorable stay. Self catering units need more kitchen utensils suitable for self catering, pots, iron etc...otherwise everything was great. I love that you have security 24/7. The fridges also need a bit of cleaning. Breakfast was of lower standard. Since we arrived our room has never been cleaned until the last day of our stay, we discussed with the receptionist & promised to address it with the cleaners but nothing seemed to have improved. As compared to the previous lodge I had bedding needs to be changed daily but in Bentley lodge since we arrived we've been using the same bedding until the last day, we never used the pool it was so dirty in such a way that we never thought of using it. I loved everything about it , it’s just the pool wasn’t really clean. We couldn’t chill but otherwise it was great. The place is nice and cosy, good value for money. We booked for one night but ended up staying for two as we were not ready to say goodbye to Durban just yet.Improvements could be made on the following:Connecting the TV plug next to the aircon power supply, to avoid unplugging the TV when charging our cellphones.A toilet door is needed, even though the toilet is not exactly facing the bedroom.Great experience overall, this is where I will be sleeping again next time I'm in Durban. 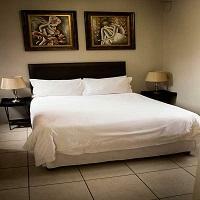 Bentley Lodge is 1.5km from the centre of Durban , the nearest airport 29.5km (King Shaka International Airport).